Custom Kitchen Scales, Personalized in Bulk or Blank. Promotional, Inexpensive. Budget Prices in USA and Canada. Bulk kitchen scales, custom imprinted or laser engraved with your logo or message. 32-ounce capacity kitchen scale. Our sturdy kitchen scales are perfect for diets, baby food, and many other uses. Mechanical scale with easy to read dial. Dual-purpose weighing container also measures liquids. Scale stores compactly inside the weighing container. 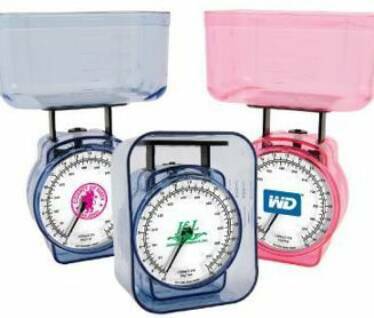 We also supply blank (not imprinted) wholesale kitchen scales for $3.22 each (minimum quantity: 50). Lowest prices in the USA and Canada for wholesale personalized kitchen scales. Free artwork design. American clients pay no taxes. We will send you a proof for your approval before production. Imprint Area: 1.5" round on the scale dial, or 2.5" w x 0.75" h on the plastic container. Typical Production Time: 7-10 days after artwork approval; Rush production is available: contact us. Blank kitchen scales ship next day.